When Mirvish produced The Lion King at the beginning of the century I never managed to see it, so I was excited to hear that the touring company of The Lion King was going to be part of this Mirvish season. And my excitement was certainly warranted. The Lion King is an absolute feast for the eyes and a treat for the ears. The opening number was mind-blowingly beautiful, absolutely breathtaking. The piece is filled with beautiful South African choral music composed by Lebo M, amazing puppets designed by Julie Taymor and Michael Curry, and fantastic costumes also designed by Julie Taymor. As a general statement, the design of this show was amazing. The performances were also fantastic. One stands out as exceptional, and that’s Brenda Mhlongo in the role of Rafiki the baboon. That woman has incredible power behind her voice and was amazing to listen to. Everything else, well, it’s what you’d expect. The story is basically the same as the movie. Not exactly, but the fundamentals are there. It’s a good story, but honestly, for me, and my show-partner Sam, this production wasn’t about the story, it was about the design. For me it was the visuals and the music, for Sam apparently it was just the visuals. It’s not that she didn’t like the music, but she was so blown away by the design, the puppets, the dancing, the whole picture, that the music felt secondary. One of the other things I loved about going to this production? All the kids in the audience. It’s so fantastic to see a new generation being introduced to theatre. It’s something to remember when going though, there will be kids there, and lots of them. So, enter with the mindset of being charmed by their excitement and let it be contagious. Otherwise you’ll just end up being frustrated when the kids act like, well, kids. Speaking of kids, Sam and I were both very impressed by the plush red velvet booster seats available for children. A fantastic idea, and a great way to welcome that new generation of theatre-goers into the theatre. By now you’ve probably guessed, I think people should check this show out. Honestly, the opening number alone is worth the price of admission. Check it out, but do it quickly, the run won’t last for long. The Lion King certainly still has the ability to dazzle after all these years! Having seen both the original Toronto sit-down production ten years ago and the tour, I noticed quite a few differences that I thought I’d mention as points of interest. Firstly, I thought the touring production felt a bit smaller, I’m not entirely certain if the production actually is all that much smaller but it looked and felt a bit smaller than the original Toronto production. There were quite a few technical elements that were scaled down for the tour which took away a bit of the show’s overall “wow” factor for me. In the original production hydraulic lifts moved scenery and performers up from traps in the stage. Pride Rock used to rise majestically from the floor of the stage whereas in this production, it just tracks on from the wings. Similarly, the grass dancers used to “grow” out from the ground and now they just come in from the sides, it’s just a little less dramatic. There aren’t as many wildebeests in the stampede scene on tour and I also noticed they eliminated the aerialists in the “Can You Feel the Love Tonight?” scene. Obviously, these are the types of concessions that have to be made in order to bring a show like this on the road and had I not known about them I probably wouldn’t have missed them. I also noticed several cuts were made to the book. Many lines of dialogue were cut (although a goofy, out-of-place, Toronto reference to Honest Ed’s was put back in for this run) and a lot of the scenes were shortened. Regrettably, Zazu’s charming Act One ditty “The Morning Report” met with the axe. 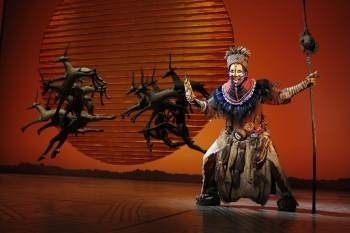 I’m told they cut 15-minutes or so from the run time of the show to pick up the pace when the Vegas production opened a couple years ago (shows usually have shorter run times in Vegas) and the producers decided the changes worked well enough to incorporate them across all the other productions of the Lion King. I’m mixed on these changes, while some of the dialogue cuts did serve to tighten the pace and improved the flow of the show I do miss some of the dialogue and Zazu’s song in the first act. I do think the current touring cast is more capable of pulling off the difficult South African choral arrangements in the score. They sound richer and fuller than I remember. The casting for the original Canadian production emphasized Canadian talent, which is a good practice I can hardly object to, however, I don’t imagine there’s a huge South African community here in Canada to draw talent from. Overall, the changes are a mixed-bag, while the show is a little less grandiose than before, I think the current tour company is very strong. The Lion King was really groundbreaking for its time and I’m glad I had the chance to re-visit the show with the Touring company now on stage. It’s definitely worth seeing if you didn’t catch it the first time around or, if you have a new generation of theatregoers to bring. That said, it’s possible that the benefit of that is that I enjoyed this production more, because I didn’t have that to compare it to, so I wasn’t missing anything.